Model = in Geography, a model is a simplified way of looking at the world to make it easier to understand. The Demographic Transition Model is a simplified way of looking at how population is changing and has changed around the world. It focuses on birth rates, death rates and natural increase. This is the number of live births per years per thousand people. It is calculated by dividing the number of births in a country by the total population and then multiplying by 1000. This is the number of deaths per years per thousand people. It is calculated by dividing the number of deaths in a country by the total population and then multiplying by 1000. This is the change in the total population of a country because of births and deaths (ie not including migration). If the birth rate is higher than the death rate then the population will increase. If the death rate is higher than the birth rate then the population will decrease. Work with a partner to create your own version of the diagram on the left. Try to add at least two additional factors that might influence the birth rate in a country. 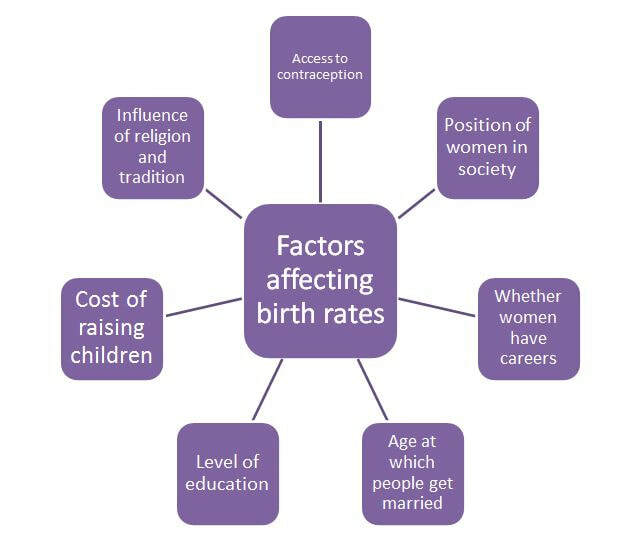 Choose any three of the factors and explain in your own words how it will influence the birth rate. Work with a partner to create your own version of the diagram on the right. 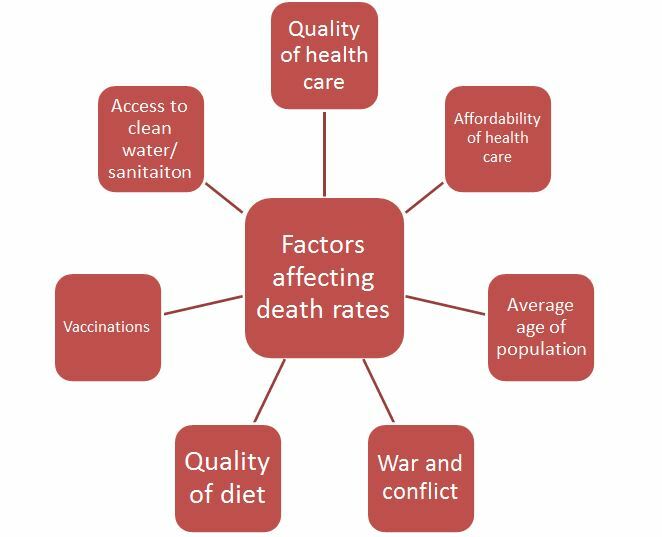 Try to add at least two additional factors that might influence the death rate in a country. Choose any three of the factors and explain in your own words how it will influence the death rate. b) Turn your page sideways and create a STAGED drawing of the DTM, adding descriptive labels as they appear on the video - you will need to 'pause' the video to give you time to do this. At the bottom of your page, list the two limitations that are explained on the video. ​a) Stick the Demographic Transition Model into your book, on the top of the page. c) Only stick them in when you are 100% convinced that you are right!